Prada phones and Pink Juicy Couture Sidekicks can step aside because the new fashionable and functional phone that will be the "IT" cellphone of 2007 is the new Apple iPhone. 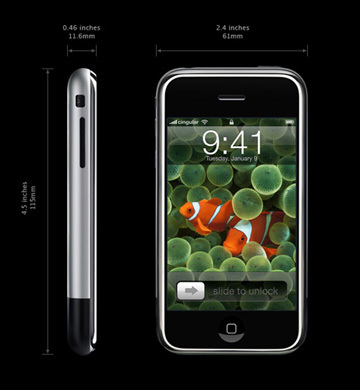 The iPhone is a mobile phone, video iPod, and Internet device -- all in one. 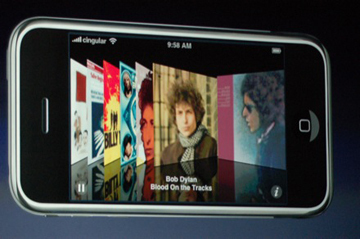 Sure you've heard stuff like that before but if anyone can pull it off with sleek design and refinement -- it's Apple. It's also widescreen where the phone magically knows to go portrait or landscape depending on how you hold it. Basically it's a Mini handheld mac that's a phone running OS X and I believe this cellphone will be a key factor in redefining mobile in the US with it's internet capabilities, where for a long time now we have been behind Europe and Asia in terms of progress. Here's a sample screen of the widescreen mode showing "coverflow" where you can surf through the album covers in your music library to play what you want. This phone is just amazingly sleek and functional. It's high time that cellphones get more fashionably tech savvy without just slapping clothing labels and adding device colors on top of things to be "fresh". Thank you Apple for finally creating a phone for the modern busy gal where the technology lives up to concept of digital style. I can't wait until June! I'll be at Macworld tomorrow afternoon and will give you an special report on all the tech gal style to be seen. 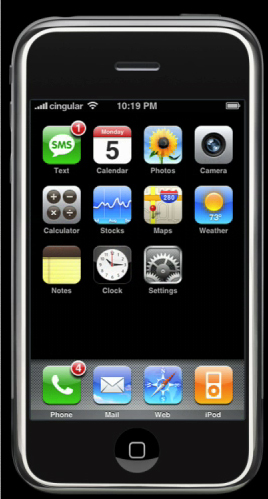 For now, don't miss the demo of the iPhone on the Apple site and check out Engadget's first pics of the iPhone at Macworld!